Home Lifestyles Have you lived in your RV during an emergency? Have you lived in your RV during an emergency? You see it every time there’s a major emergency — a hurricane, wildfire, flood or other disaster — highways packed with vehicles leaving town, including many RVs. 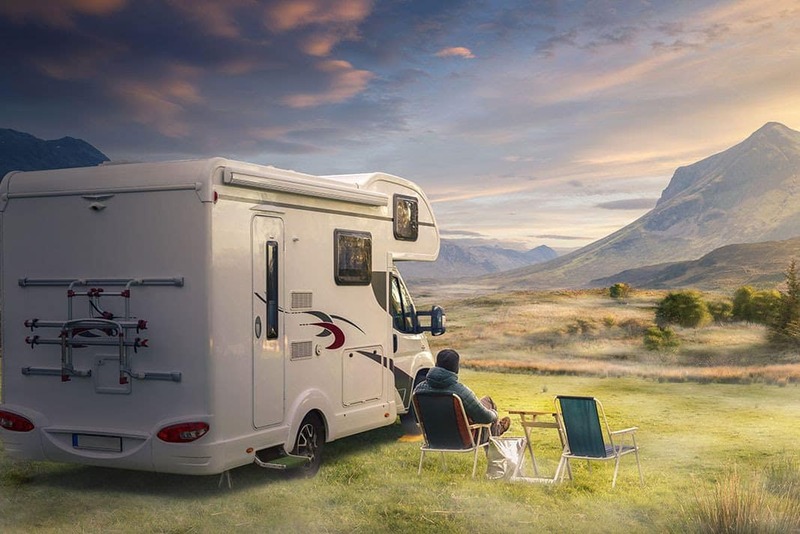 For those with an RV, waiting out the storm or other disaster, or even living in the RV for a few days, weeks or longer is a blessing compared to those who need to find lodging. How about you? Have you ever used your RV during such an emergency? Please answer the poll, and leave a comment. The poll may take a few moments to load, so please stand by. I was at work when the Eastern Seaboard power grid failure occurred in August of 2003. I made my way home after a hour (normally a 15 min. ride), and my husband had already started the generator in our 39′ Holiday Rambler parked on our lot. I came home to cool air, hot shower, TV, and dinner. We lived in our coach for three days, and except for the close quarters, it was pretty transparent! These coaches serve more than a pleasure purpose. After Hurricane Irma, we were without power for a little over a week in 90+ degree weather. We were able to sleep and take warm baths thanks to our RV, 3 kids, 2 adults and an elderly lady were very comfortable! Already full timers, we were staying in a nice park ouside of Escondido California, when all ! @() broke loose. 2008 wildfires exploded all around the park. We could catch updates on local news… the devastation was sickening. Authorities decided it was better for those of us at this park, to shelter in place rather than chance moving thru the inferno to safer ground. The park was untouched, thank God, and we were able to move on after couple weeks of high winds and flair-ups. Will never under stock our necessities again! Not a bad emergency but a good one. Our house sold within 6 hrs of being listed. They wanted us out in 3 weeks. Making a huge profit, we agreed. The estate sale company needed us out for a week. After it was all done, we had no where to go in our small town. Everyone wanted a years lease. We moved into our RV and a store bldg. We loved it and are now FT. The store bldg is gone. We have used the generator to power refrigerators in the house after hurricanes in Virginia Beach, and spent the afternoon in it to use the air conditioning while waiting for power to be restored in the neighborhood, but went back into the house at night. We have also gone out to the motorhome to finish cooking dinner when power was lost to a thunderstorm. We sat out Hurricane Sandy in our motorhome in Salisbury, Maryland, but we just happened to be there at the time. We had to stay in our 5th wheel during a winter ice storm that knocked all power out in the area for a week. We had all our comforts and warmth during that time. We did not have a generator but our neighbor did and we were able to hook up to him to keep our batteries charged. Once power was restored, we ordered a generator and have not been without one since. Sorry not to be able to participate in Survey, It has not showed up. I reported last week that I had not been able to see the surveys for the 2 previous weeks. Turned out to be caused by Ad Blocker Plus. If you use an ad blocker, click its icon on the menu bar and click “enabled on this site” to disable it. Stayed in our Travel Trailer for the Summer while our house was being remodeled, just parked it over the septic tank and used it like a campground. We had electric, water and most of the comforts of home, just more cozy. We loved it . We moved out of our sticks and bricks on an engineer’s advice and awaited resolution of the insurance claim. Spent 46 months in our travel trailer. Fixing the place was one-third the cost of continuing the lawsuit against the insurance company. We fixed the place and moved back in. Wow!!! That’s awful. The price of lawsuits and lawyers are ridiculous. I have a crazy ex who has sued me 6 times over the last 10 yrs. I usually represent myself unless it’s too complicated. Not always an option. Like in your situation, I wouldn’t have a clue. So sorry this happened to you. We have used our RV’s referidgerator to strore refrigerated food for for 2 days during an extended power outage. I lacked confidence in the generator and extention cord while we were away at work. Since we’re full-timers we did have to move for Hurricane Mitch which, of course, was no big deal. Being mobile can really be an asset at times. When we did a complete renovation of our house 6 years ago, we had to move everything out. We lived in our RV, parked right next to the house for 4 1/2 months. We had full hook-ups, including Wi-Fi & satellite TV from the house connections. It made our project easier since we had no commute time by being right on the premises, and all free time was used for work. During Hurricane Katrina, temporary set up in my GMC Motorhome, turned on Mr. Onan, power cord to home frig and neighbor’s, turned on A/C, and TV. I have complete amateur radio system in my coach and have supported our county’s emergency operations thru nine hurricanes and other events. During a flood in NM twice…….once we were evacuated by helicopter but the 2nd time we opted to stay in our RV and lived comfortably on our self containment and solar system. Last year we made it through Texas during hurricane Harvey then delayed our arrival home (FL) in Arkansas until hurricane Irma had finished its destruction and we knew power had been restored to our house. We arrived home to tree damage but, thankfully, no structural damage to our house. I didn’t stay in our class c, but did hook up the generator to supply power to our house. I’m a Florida based RV’r. Last September we got clobbered by another hurricane and no power or water for over a week. Moved the food and fur family into the RV to survive. Was quite comfortable compared to 2004 pre owning an RV and again went a week plus without power and water. Stayed 3 miles from home in a Walk Mart parking lot in our class A during flooding in our area, all the convienyance of home. Got our meals from the store deli, and shopped for fishing equipment for when the storms let up. Wal Mart a very gracious host, Thank you Walmart. Used a 5th wheel during an ice storm, snug as a bug in a rug plenty of heat water and all the comforts of home, it was in the pole barn in no danger. My husband & I stayed in our Class A to have running water (we have our own well) and AC last fall. Additionally, we ran an extension cord to power our refrigerator and freezer for 2 days until power was restored.